Drones surveying tropical forest recovery are just as effective as manual monitoring, and a fraction of the cost. Tropical forest regeneration is ramping up in a bid to boost conservation globally. Monitoring regeneration can be labor intensive and expensive, making it difficult to know whether conservation efforts have been successful. 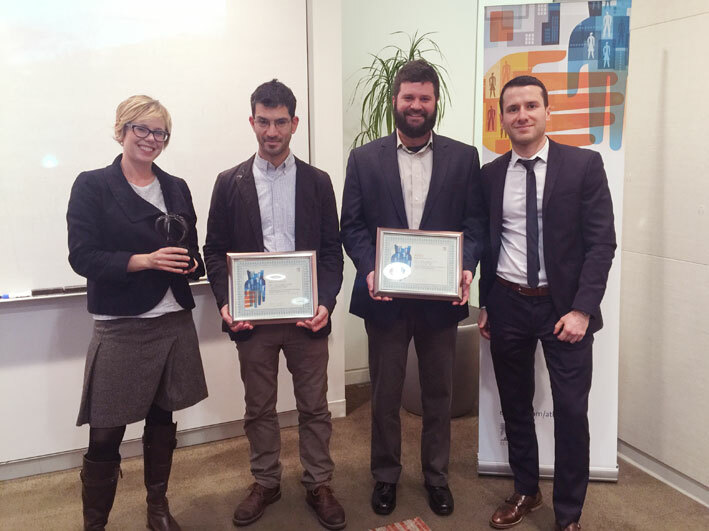 However, manual monitoring isn’t the only option, according to a new Atlas award-winning article. 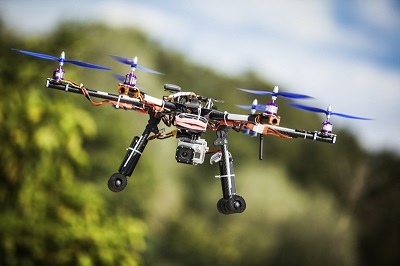 Unmanned Aerial vehicles – or drones – are becoming increasingly popular among hobbyists, businesses and scientists. New research published in Biological Conservation now suggests they could replace people in monitoring the success of forest regeneration in the tropics, saving a significant amount of time and money, and improving the data collected. Between 1990 and 2005, the world’s rainforests were depleted by more than 8% through deforestation, in part to make way for agriculture. Today, large areas of agricultural land are being restored to rainforest to meet conservation goals in the tropics. It is important to monitor the success of these efforts to ensure these areas are replenished with the right vegetation. But monitoring such large areas of land is difficult, especially since many land owners are individual farmers. Traditionally, rainforest regeneration has been monitored manually. This requires skilled, knowledgeable people and specialist equipment, and can be especially challenging if the land is difficult to access. An alternative to manual monitoring is LiDAR – remote sensing technology that analyzes reflected light. However, a single LiDAR flight to monitor forest recovery remotely can cost upwards of $20,000. In the new study, Dr. Zahawi and the team, including researchers from the University of Maryland and the University of California-Santa Cruz, USA, tested a new automated approach to monitoring that doesn’t involve manual intervention. Using an inexpensive drone-based remote sensing methodology called "Ecosynth", the researchers measured the structure of the forest canopy across in 1-hectare regenerating fields that were previously agricultural land spread over 100km2 of southern Costa Rica. The land is part of a long-term tropical forest restoration study. The drones were fitted with a simple 10 megapixel point-and-shoot digital camera and use open-source software to process these overlapping images. The camera takes thousands of photos and the Ecosynth methodology creates 3D images called point clouds that represent the vegetation. In total, the drone and camera cost US$1500 – less than a tenth the cost of some equivalent flights. The researchers compared the results produced by Ecosynth for canopy height, above ground biomass and canopy structure – whether the canopy was rough or open – to field based measures. They also evaluated whether Ecosynth-measured canopy height could predict the abundance of fruit-eating (frugivore) birds were present as field based height measures; many fruit-eating birds, such as the mountain thrush, black guan and sooty-capped bush tanager, are important for forest regeneration. The results showed that Ecosynth was as accurate as human monitoring, although there were some errors when the canopy was low. More and more land owners in the tropics are restoring their agricultural land to forest, and monitoring is key to the success of these projects. But at $20,000 per LiDAR flight, monitoring is prohibitively expensive. 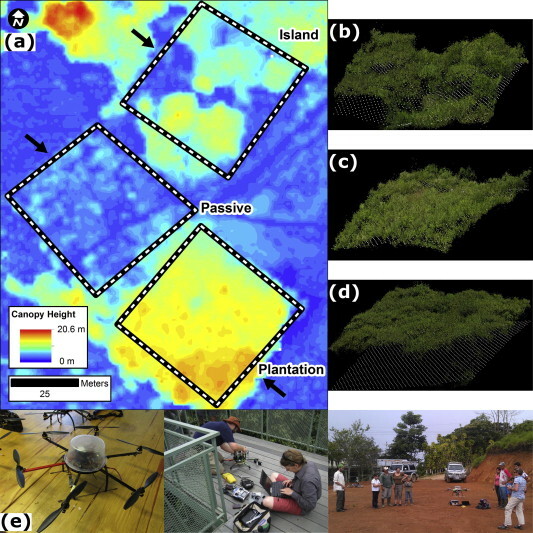 New research published in Biological Conservation shows that using drones can cut the cost of monitoring to just $1500 for the equipment, and even less for subsequent flights. We talked to lead author Dr. Rakan Zahawi from the Organization for Tropical Studies to find out how the technology works, and what it means for the future. In this podcast Dr. Rakan Zahawi talks about the Ecosynth methodology and using drone technology to monitor tropical forest regeneration at a fraction of the cost of traditional techniques. Why is there a trend towards restoring land from agriculture to forest in the tropics? There’s a number of reasons behind that. You can have land that becomes unproductive, changes in market economics, or incentives such as payments for environmental services, or a monetary value for reforestation coming into effect. There are also private reasons, such as conservation organizations buying land and conserving it, or a particular community interested in protecting their watershed and so on. What are the challenges associated with monitoring the success of conservation projects? Well the challenges are largely cost-related. One of the biggest expenses is establishing a project, but then you have the monitoring; if you want to look at something long-term, restoration takes more than a few years, so if you’re looking at a decade or multiple decades, you need to have some mechanism in place to monitor that. A lot of funding agencies aren’t that interested in funding ongoing monitoring – it isn’t as attractive as investing in a new project. The costs attributed to monitoring include having skilled people on the ground to do the surveys, and that’s a time investment and a financial investment. The monitoring is important to be able to evaluate the success of the project. In restoration there’s not a recipe book where you basically have one format or you just go out and plant any random suite of trees. It’s a fairly involved process and so we’re still at the stage in restoration where there are a lot of new innovations and ideas of how to go about it and so being able to say whether idea A versus idea B is better is important. What made you think of testing unmanned aerial vehicles for this, and has it been tried before? In addition to my main collaborators on the restoration project, this was a collaboration with the University of Maryland, with Erle Ellis’s lab and Jonathan Dandois. They had tested this methodology up in Maryland on very flat terrain and it worked fairly well there, with a lot of baseline information already present. So the idea was can we actually apply this in areas where you don’t really have all that information they had in Maryland. In a nutshell, what were the results of your study with Ecosynth? Remote sensing technology has been around for decades. As drones have become much more mainstream, the cost of making them has dropped tremendously and the drone we built with everything included cost about $1500. We installed a simple photographic point-and-shoot camera on the drone; when you fly it over an area of interest, the camera takes several thousand photographs which are then processed through open source software to create a point cloud image, to make a three-dimensional image of the area. You can then use that information to see what your canopy height is, how bumpy it is, the roughness, whether you have open areas or not. What would be needed to implement the use of this technology more widely and what impact could it have globally? I think this is in its infancy, but I personally think this will become much more mainstream in being able to survey many different metrics. It doesn’t have to be restoration; you can do it to do a number of different surveys of vegetation you might be interested in, such as when trees become deciduous, when they start flushing leaf flush or when they’re flowering. The advantage is once you figure out how to use it and apply it, you can basically go out any day of the week or month and do this, you don’t need a whole team to go out and survey. What’s the next step for this research? The person who did all the flights is now working on Barro Colorado Island and doing a lot of different assessments on what are the limits of these drones. Probably the biggest handicap that they have is when you take a photograph of something you just get the surface view, you can’t go through a physical structure. In order to figure out how high your canopy is, you also need to know what the ground level is; if you have a closed forest then it’s very difficult to do with a drone. In this case, you probably first have to bring in a different technology, such as laser technology, to get a ground map of the area. Leading international journal Biological Conservation publishes articles about research in a wide range of fields in conservation. Research published in the journal contributes to the biological, sociological and economic dimensions of conservation and natural resource management. Biological Conservation covers topics such as extinction risk, the spread of invasive organisms, conservation management, restoration ecology and resource economics.